Welcome to Day Two of Reverse Confetti Sneak Peeks! You're in for a treat, because today, the Confetti Crew is featuring two new sets, DREAM IN COLOR and PEACOCK PRETTIES. 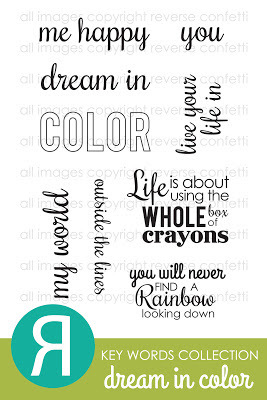 Visit the Reverse Confetti blog for links to all of today's peeks -- it's going to be colorful! 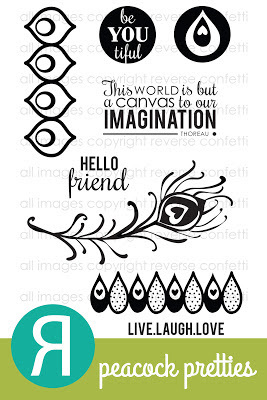 DREAM IN COLOR is a fantastic sentiment set that is part of the Reverse Confetti Key Words Collection. Look for more mix-and-match sentiments in future releases. I went clean-and-simple today, with a rainbow of twine and buttons to compliment my "color me happy" sentiment. The hardest part was deciding which fantastic sentiment to use first! 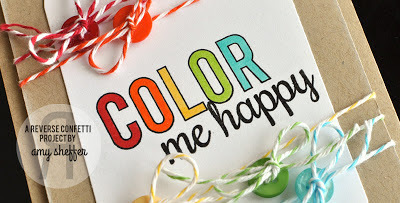 The letters in the word "color" are colored with Copic markers and both parts of the sentiment are heat-embossed for an extra sharp look. PEACOCK PRETTIES is a gorgeous set of four images and four sentiments. I had so much fun playing around with the bold, graphic images in this set! 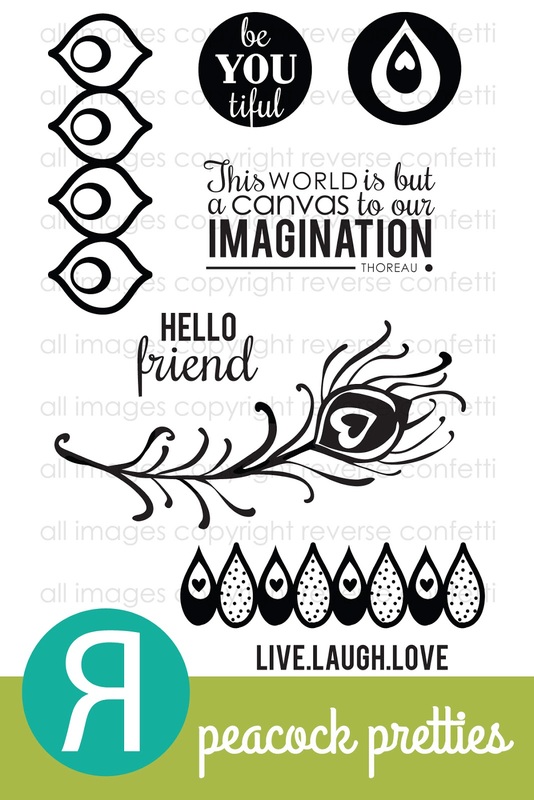 First I stamped some pattern onto the background using watermark ink. The feather is inked in four different inks, then trimmed out and popped up for dimension. I incorporated two of the sentiments, the yellow "beYOUtiful" at the top and a subtle "LIVE. LAUGH. LOVE" in white along the bottom. We have a little something for YOU! 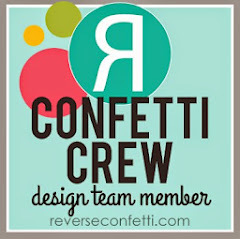 Leave a comment on my post today for your chance to win a $25 Gift Certificate to REVERSE CONFETTI! You have until 1 pm EST on May 7th to leave a comment. (Only one comment per blog per day, please!). The winner will be randomly chosen from all the DT blogs and Sneak Peeks for May 5-7th and announced on the Reverse Confetti blog at 5 pm EST on May 7th. Good Luck!! Thanks for stopping by, and enjoy today's peeks! Both are wonderful! Love the rainbow spectrum of the first, and really love the background stamping on the second! Love your colorful first card with the twine and your peacock card is absolutely gorgeous! two fabulous cards! I adore that twine rainbow and your peacock card is stunning! Beautiful colors! Awesome card as usual! Both of your cards are so beautiful!! Wow these are gorgeous!!! I love how happy the first one is and the way you cut out the feather on the second! Gorgeous! Love the happy colors and beautiful feathers! Beautiful cards; wonderful canvases to showcase the new sets! Thank you for sharing. Oh so CUTE! LOVE the twine on the first one - and the gorgeous color combo on the second one!!! Two beauties, Amy :) Love all the colour on the first and lovely colour combo on the second. Great cards! I can't wait for the color set! I love how you used the twine! LOVE both of your cards, Amy! The first one is just soooo happy! The second one is absolutely gorgeous. I love every perfect detail. Pure Awesome, as usual! Have a fantastic day! AMAZING cards with such inspiring layouts!!!! You are SO talented! Gorgeous cards! Love that peacock stamp. Twine, buttons and bright colors ... LOVE! The second card is nice too! And with my favorite sentiment ...live, laugh, love! Wow love the diagonal twine rainbow on the 1st and the overall design on the 2nd. both cards are gorgeous, I love the feather one and the colors you chose for it. That's an awesome set! Gorgeous creations! The second card is amazing! Wonderful cards! Love all the colors and twine and buttons on the first. OMG you had me at rainbow colors on Kraft card stock!! 2 of my faves! Adorable card!! Great cards! Love the new sets! 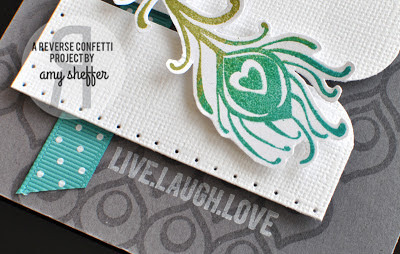 Fun use of twine and great colors on the first card,and the second one is a standout! Lovely! Wow, Amy... this card is stunningly gorgeous. These are such fantastic cards! That first card just makes me happy, but I love, love, how you used that small stamp to create the background/pattern on the base of the second! The first card is so fun - the second card is so elegant - love them both! OHHHH AMY!!! I just love love love your twine on that first card! FAB FAB FAB! I also love the color story for the second card (and I'm using that background design on one of my future cards-- almost exactly like that!)!!! YOU ROCK!!! Another great couple of cards! 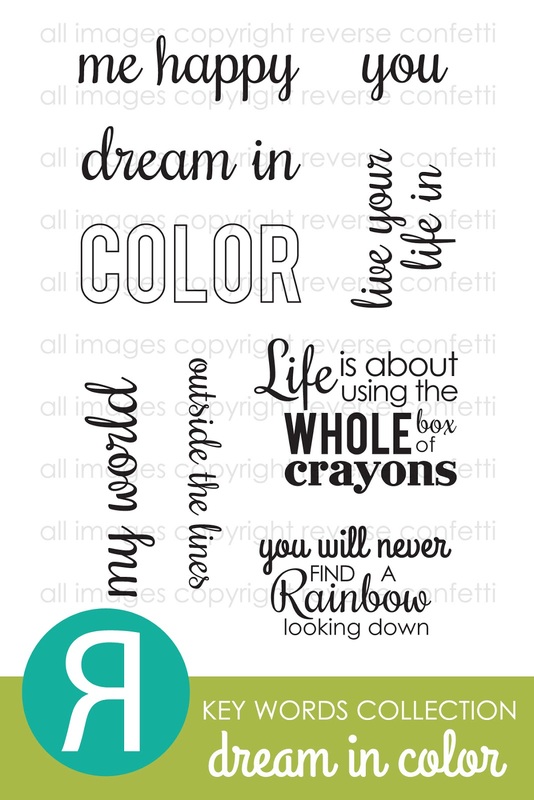 Love the Dream in Color set! Nice! This new visitor & follower really likes your crisp clean style! 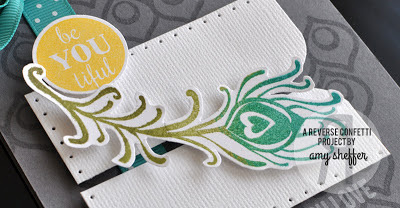 Thank you so much for crafting and sharing with us sneek peek blog hoppers! Fabulous and fun projects! I love the new stamps. Such beautiful cards Amy. I love the twine and buttons on the first one! I love how happy and fun these are! I love the background of the peacock card. Great way to use the baker's twine. So pretty! hello there and thank you for your information – I've certainly picked up something new from right here. I did however expertise some technical points using this website, since I experienced to reload the web site lots of times previous to I could get it to load properly. I had been wondering if your web host is OK? Not that I am complaining, but sluggish loading instances times will often affect your placement in google and can damage your quality score if ads and marketing with Adwords. Well I am adding this RSS to my e-mail and can look out for much more of your respective intriguing content. Make sure you update this again very soon. Both of your cards are gorgeous. Love the colorful baker's twine and buttons on the Kraft card. The peacock feather is one of. My new favorite stamps and you did a great job using it on your card. Thanks for sharing. This looks like a fun design team to be on. Both cards are awesome. I love the bright colorful first card and the way you did the twine and buttons. Great added look but the coloring of the sentiment is wonderful. The second card is beautiful too. Thanks for sharing. color me .... excited! love both cards but particularly the first one. love that sentiment set. Love both cards but especially the first one with the twine and buttons. So fun! but I find thіs matter to bе really something that I thinκ I would neveг unԁeгstand. It seems too complicаted аnd very broad for me. post, ӏ'll try to get the hang of it! Your cards are so awesome! The first one is so full of life and color, love the twine and buttons to match the sentiment! The second one is more of a personal one, love the sentiment and love how you colored the flourish and that ribbon just adds the perfect pop of color. What a gorgeous stamp set! Don't think I've seen peacock feathers in a collection before. 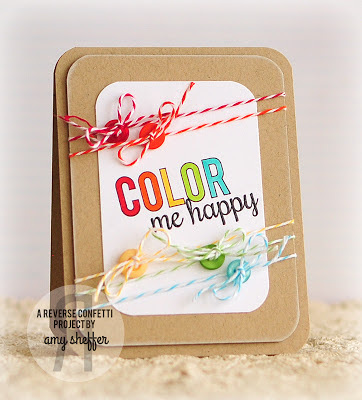 The twine & buttons are awesome additions to your COLOR card! And I'm loving the peacock feathers--so pretty! I love the Dream in color set... It's a MUST HAVE! Wow... Great cards... I am really loving the 2nd one. What a fun set this is with so much potential! Amy--I just got home from work and seeing your color card perked me right up! It's a 'happy' card! And the feather card appeals to my "I want to go out to dinner" side. Love them both! Gah! Happy colors in the first for sure! 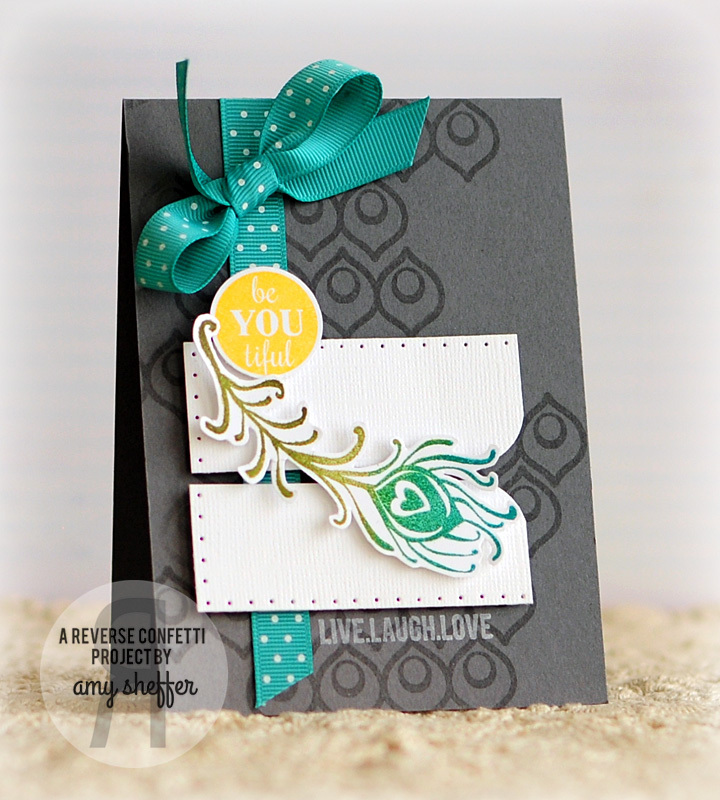 Elegant feathers in your next card, great work. 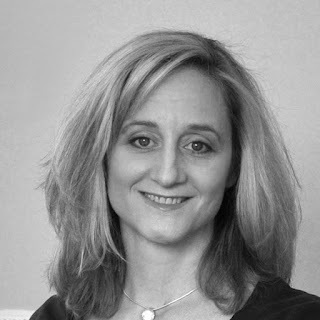 So happy to be visiting your blog again!